The great characters crafted in Watch Dogs 2 contrasts how the game wants you to play it. Its likely common knowledge by now that Watch Dogs 2 is a grand improvement over the first, if we listen to popular opinion that is. Though by no means a perfect game, the tweaks, fixes, additions, and general changes from it’s predecessor make it the preferable experience for many. It may not be game of the year worthy, but it has rightfully earned the title of a good, and possibly even a great, game. 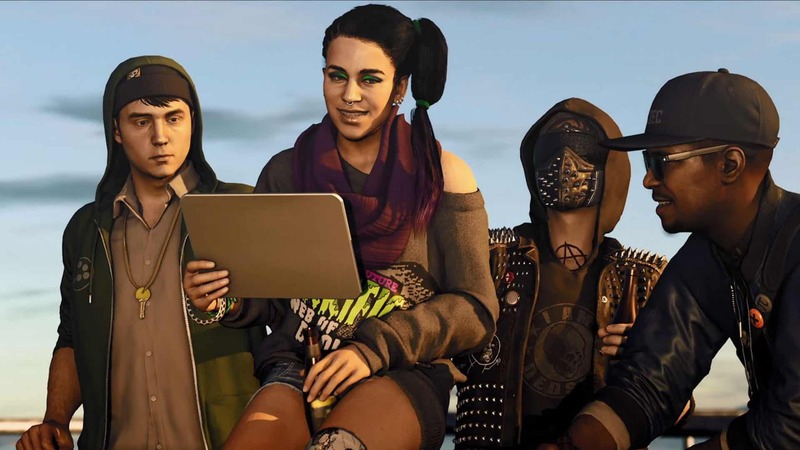 For all the things Watch Dogs 2 does right, for all the improvements and additions, the game does have one glaring flaw: our main characters are too damn likable for the mechanics focused on. Though there was worry leading up to the release that the characters may be too outlandish, possibly even ‘cringe-worthy’ but Marcus and our ragtag crew of hackers have endearing personalities in spades. Marcus in particular has some good moments towards the very beginning bathes his character in an air of realism and charm. The tonal shift found in the sequel breathes some much needed life into a franchise whose first impression was an overly serious action fantasy dealing with street gangs and family drama. What comes from all of this is a much more suiting match for the series, going more of a Hackers vibe than a Blackhat one. Nearly right off the bat the tone is vastly different than it’s predecessor. Whereas before we had Aiden towering over and torturing a man who is half beaten to death, now we have Marcus diving into an air duct while flipping off security with both hands. What we learn just from these opening scenes alone tells us how different the experiences are. We learn Aiden is a clearly violent man whose gravelly voice matches his brooding stature. Marcus, on the other hand, wears bright clothing and speaks in almost all in quips and one liners. Even the scene following, which introduces us to the rest of the bunch, gives us insight to who all we will be dealing with. After a drunken night out by the beach, a hungover Marcus wakes up in a room he is unfamiliar with and a phone that isn’t his. Confused and surprisingly unconcerned, he answers a call that tells him what’s going on and where to go, but the only concern being ‘who’s phone is this?’ in an exhausted and almost mumbled voice. In just two scenes, Marcus is given much better, and likable characterization than Aiden is in almost an entire game. The same goes for the majority of the crew as well. Though they aren’t the most grounded or realistic of characters, they are most certainly likable to some degree. As Marcus interacts with various members of the team, it fleshes out both them in the process. Even the smaller moments, like when Wrench and Marcus gush over a beloved nerdy franchise, all of it only brings us closer to these characters that we want to know more of. But now comes the main issue: how these characters are portrayed almost directly contradicts what the game often asks of the player. Though the narrative tone has shifted, the gameplay has not. The focus on hacking has become more fleshed out, but there is still a very heavy focus on gunplay and lethal tactics. These people that we grow to know and become fond of, starkly contrast the type of people we tend to think of as cold blooded killers. They are not sociopaths. They are not murders. They are not Aiden Pierce. In all fairness, the game never does outright push you towards any sort of lethal playstyle. At no point are you forced to pick up a gun and use it; in any situation, the player is allowed to tackle it in anyway they see fit. That said, there are far more options to those looking to stack up their body count. From a shocking arsenal of guns just waiting to be 3D-printed, to hacks that blow up the environment around you, to just general trinkets you can build on the fly to explode at the enemy’s feet, there is plenty there to quench your virtual bloodlust. The question stands if that bloodlust is shared by the characters that the devs have crafted in the game itself. The goal of this group is in no way malicious; in a lot of ways they are like a collection of diverse Robin Hoods for the digital age. One of the first missions is to steal a famous car to reshoot a trailer for an upcoming movie. Another sees you trying to steal an unreleased single from a local rapper. On the side you give car rides using the Uber-but-not-Uber app, Driver San Francisco (yes, we see what you did there Ubisoft, very clever). None of the actions of your crew or missions you go on really care for a violent approach; the option is always there but it feels out of character for who you play. Though we as a society tend not to portray sociopaths as cheerful, likable people, they also tend to not fit the bill. On the contrary, Marcus and his friends are genuinely likeable and pretty cheerful given the world they live in of Big Brother esque monitoring and big business monopolies. The way they are written is so well done, that it does actually feel out of character to take one of the any more violent outlets. Unfortunately, the majority of the options for any given situation are more lethal than are not. People like consistency, usually. When a pattern is found, we like to stick to it. It is in human nature to find, and follow patterns, and personalities are no exception. When someone plays a Telltale game, or something like Until Dawn or Heavy Rain, players have been found to chose character responses in a consistent matter; it makes the experience feel more real and grounded. Watch Dogs 2 is woefully inconsistent. It presents us with these twenty something, looking to change the world with no malice or ill will in their presentation, and thus turns around and immediately grants the player access to dozens of weapons. Who these characters are in game, and how the developers want us to play the game are two different experiences. One side tells a tale of a lighthearted hacker group who take part in pretty small affairs, like rewarding struggling college students with small lumps of cash, or gawk over freshly released movie trailers. The other side tells us these are kids with no care of human life, who can make grenade launchers in a minute and use them on passersby outside. Take something like Grand Theft Auto 5 that more or less grants the player the same amount of free will. Franklin, Micheal, and Trevor are all introduced as violent people in some fashion- hell even our introduction to latter two is through a bank heist. We know these are people who have the capacity to carry out terrible deeds if need be. When we launch a rocket into a crowd of occupied motor vehicles in this game, it fits the character of who we are playing as, and it feels proper to do so in their shoes. Watch Dogs 2 gives us some of the best characterization I have seen in quite a long time, and unfortunately the strides it takes in this department are lost as it then asks us to betray the characters they’ve built for weapons and gadgets that are oddly distant from the rest of the game. Who these people are, and what the game wants us to do are two entirely different beasts. Though in on itself, these mechanics are fun and well done, they have no place with these characters that Ubisoft has so finely crafted.